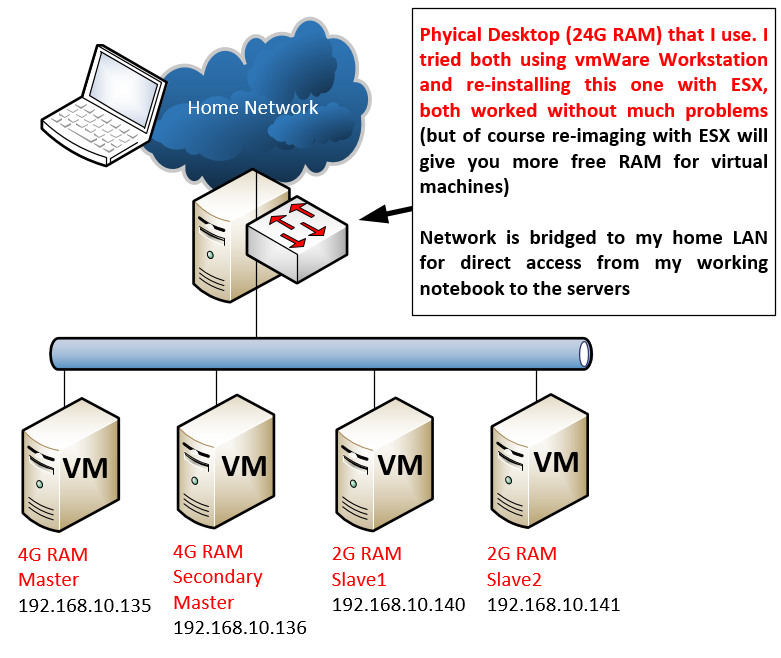 What I have used for my cluster is a home PC with 32G of RAM to run everything inside using vmWare Workstation. But this guide is applicable even if you run this usingVirtualBox, physical machines, or using virtual machines on some Internet cloud (e.g. AWS/Azure). The point will simply be 4 independent OS linux boxes that are together one a shared LAN to communicate between each other. Step 7) MapReduce Java code from the HelloWorld example we just run? For this one there is not much to say about topology, I simplified everything on network level to a single logical segment by bridging the virtual network to my real home LAN to make my own access simple. However in any real deployment with more systems you should consider both your logical network (ergo splitting to VLANs/subnets based on function) and also your rack structure as Hadoop and other cloud systems are very much delay sensitive) and physical network. This is a combination that I found stable in the last 6 months, of course you can try the latest versions of everything, just a friendly note that with these cloud systems library and versions compatibility troubleshooting can take days (I am not kidding). So if you are new to Hadoop, rather take recommendations before getting angry on weird dependency troubles (which you will sooner or later yourself). Test no with ssh if you can login to each server without password, for example from master node open ssh with “ssh ubuntu@slave1” to jump to slave1 console without being prompted for password, this i needed by hadoop to operate so should work! NOTE: In production, you should always only move only the public part of the key id_dsa.pub, not the private key that should be unique for each server. Ergo the previous key generation procedure should be done on each server and then only the public keys should be exchanged between all the servers, what I am doing here is very unsecure that all servers use the same private key! If this one is compromised, all servers are compromised. Simply download Hadoop 2.7.1 from repository and extract. Actually out-of-the-box Hadoop is configured for pseudo-cluster mode, which means you will be able to execute it all inside one server, but this is not why we are here and as such our target here is to configure it for a real cluster. Here are the high level steps. Remove “yarn.resourcemanager.hostname” property from yarn-site.xml ONLY ON MASTER node otherwise your master ResourceManager will listen only on localhost and other nodes will not be able to connect to it! Since we now have Hadoop fully configured, we can format the HDFS on all nodes and try to run it from Master. Explanation is that ResourceManager is YARN master component, while NodeManager is YARN components on slaves. The HDFS composes of NameNode and SecondaryNamenode, while DataNode is HDFS component on slaves. All these components have to exist (And be able to communicate with each other via LAN) for the Hadoop cluster to work. Check the number of DataNodes visible to YARN (picture below), if you have this it means that the slaves have managed to register to the ResourceManager as available resources. Ok, there two paths here. Use super-small Hadoop Java program that I provide step-by-step below to build your own application and run it to count all words in all the plays of W. Shakespeare. However, for me this didn’t worked by default because Pi example asked for 8G of Ram in the YARN scheduler that my 2G slaves were not able to allocate, which resulted in the application to be “ACCEPTED”, but never scheduled for execution by YARN. To solve this, check below extra references on RAM management that you can optionally use here. So you can simply start executing these one by one and you will manage to get at the end a result of counting all the works of William Shakespeare (provided as txt inside “./input” directory from the download). Simply uses HDFS manipulation commands to create input and output directories in HDFS and upload a local file with Shakespeare texts into the input folder. This one is more interesting, it uses Maven framework to download all the java library dependencies (these are described in pom.xml file together with compilation parameters, names and other build details for the target JAR). NOTE: As first part I am always removing the output folder, the point is that the Java JAR is not checking if the output files already exist and if there is a collision the execution would fail, therefore ALWAYS delete all output files before attempting to re-run your programs with HDFS. 16/06/02 14:36:26 INFO fs.TrashPolicyDefault: Namenode trash configuration: Deletion interval = 0 minutes, Emptier interval = 0 minutes. 16/06/02 14:36:33 WARN mapreduce.JobResourceUploader: Hadoop command-line option parsing not performed. Implement the Tool interface and execute your application with ToolRunner to remedy this. The last simple step is simple to read the results of the Hadoop code by reading all the TXT files in the OUTPUT folder. The output will be really long, because this very simple program is not removing special characters and as such the results are not very clean, I challenge you that for a homework you can work on the Java code to clear special characters from the counting and then second interesting problem to solve is sorting, which is very different in the Hadoop MapReduce logic. Now I will only tell you here that the Hadoop is using a programming methodology called MapReduce, where you first have to divide inputs based on defined key (here simply any word is a key) in the Mapping phase and then group them together while counting the number of instances of a given key during Reduce phase. One thing that you might have noticed here is the fact by default, the YARN is not setting much limits on the so called “containers” in which applications can run, this means that application can request 15G of RAM and YARN will accept this, but if he doesn’t find this resources available, it will block the execution and your application will be accepted by the YARN, but never scheduled. One way how to help these situations is to configure YARN to have much more real RAM expectations on small VM nodes like we used here (you remember we have here slaves with 2G RAM each). Please consider mandatory reading because you WILL have RAM related problems very soon yourself, if not with low RAM, then also alternatively if you are using slaves with more than 8G of ram, by default Hadoop will not use it so you have to do these configurations to also avoid under-utilization on large clusters. So on this point you should have your own small home Hadoop cluster and you have successfully compiled your first HelloWorld “Word Couting” application written to use the MapReduce approach to count all the words in all works of W. Shakespeare and store results in a HDFS cluster. Your next steps from here should be to explor my example Java code of this Word Couting example (because there is bazzilion explanations on WordCouting in Hadoop on the net, I didn’t put one here) and if you want to truly understand the principles and also go further to writing more usefull applications, I cannot recommend anouth the free coursera.org Cloud Computing specialization courses (which are free) and I spent on them last year lot of time learning not only Hadoop, but also Cassandra DB, Spark, Kafka and other trendy names and how to write usefull code for them. My next step here is that I will try to write simipar quick LAB example with expanding this LAB also with Spark (as it also uses YARN in the background) which is a representative system for stream processing. Stream processin is very interesting alternative to MapReduce approach that has its own set of problems where it can be more usefull than basic MapReduce. Final NOTE: Hadoop and the whole ecosystem is very much a live project that is constantly changing, for example before using Hadoop 2.7.1 I have literally spent hours and hours troubleshooting other versions until I find out that they are not compatible with some libraries on ubuntu 14.04, or for example spent another hours when integrating Cassandra DB and Java API for cassandra (called Datalex) until I realized that these simply cannot be compinded inside one server as each demands different Java and some libraries, as such my warning when going into OpenSource BigData is that you will definitelly get tired/angry/mad until you have a working cluster if you run into a wrong combination of versions. Just be ready for it and accept it as a fact. How can run Mapreduce program concurrently? For one map task, how many cpu cores are needed? My currently problem is Mapreduce based Neural Network training time is so long!